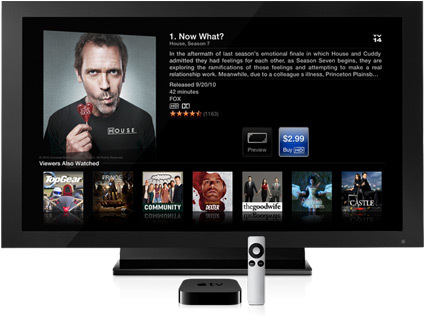 Discussion in 'Apple TV and Home Theater' started by Apple Key, Mar 5, 2012. Since there are so many rumors about Apple coming out with a TV, I thought I'd put together a mockup with my take on what it should look like. This is really just for fun. Let me know what you think. I like the concept design, but this resurrects the debate as to what the point of an Apple-branded television set is anyway. What you've mocked up here is basically just a regular HDTV with the ATV interface that is already available via the ATV set-top box. I can't understand why Apple would try to get into this market. Why would I pay a premium to switch out the TV screens I already have when I can get all the same functionality for $99 (ATV2) on any television set I could buy? I understand what you're saying, but this is pretty much purely for aesthetic value. The screen itself was just to show something on it so that it's not empty. I have no idea if they will make one, but I think they could find a way to add value for the user. I think black works better for a television because it is all about the display itself, and when you are watching it, it can more easily disappear to the user. I understand what you're saying, but this is pretty much purely for aesthetic value. The screen itself was just to show something on it so that it's not empty. I don't disagreed with you, black works better, but Apple may not agreed with us , for what it worth most of the front part is black. Not bad, but you really should lose the "chin". This is more in line with my taste (read: no chin) ... but I think I would prefer square corners. Also, where are the speakers? Not everyone uses an AVR. Just noticed the speakers are on the back. Not sure what you're referring to as the "chin". ... but I think I would prefer square corners. You mean like the one on Apple.com? I doubt they would hide the design in plain sight like that. Plus, I believe this image was made to look extremely generic. Ah, I see. Didn't know there was an official term for this. I prefer to keep the chin. Plus, I was thinking that they could use this area to display message to the user (I know it's not at all displayed in the original image - something along these lines). That image on apple.com is very old. They're using a generic looking TV set so that they aren't giving any other manufacturer free publicity. Personally, I like square corners. The rounded ones remind me of HP monitors. Not a sleek TV. I do like the idea of putting messages in the "chin". Not sure if it would be readable from 8 to 15 feet away (traditional viewing distances in the US). Always thought that picture was based off the Kuro design. Yeah, it is pretty similar. How close to the unit do you sit?? I ask because Im wondering the remote of my ATv2 won't work beyond a certain distance (18 feet) and also needs LoS for signal. If I strap the ATV to the back, I think I may have communication issues between the remote and the ATV. Here's a mockup I just made. Ufff... no more black+aluminum thank you very much. I wish they'd bring back the pure white designs. Or hey, maybe they surprise everyone by resurrecting CRT-technology and the original iMac design along with the current TV-sizes (40 - 55") thus creating the biggest TV available. Nothing new here. This is identical to the Apple Cinema Display. Base is too high also, and I doubt that's the remote that it'll come with. I see why it doesn't seem like that would be the remote they would use, but I also believe they would try as hard as they could to make it that. Referencing things like the 1984 Macintosh campaign and pretty much the Mac in general up to now they are all about getting less buttons and more options with those buttons. Holding down the center button could power on and off the tv. Hit menu and you get four options, one for each arrow: a # pad, a input select, a menu, and a Short cut menu. Then for normal control you could use the arrows out of menu to navigate channels up and down, as well as volume side to side. Now if they do their market research right they might find that it isn't wanted to navigate the whole tv with that, but if that's the case I believe they will also make a new apple remote that will operate the tv and be backwards compatible with everything the classic remote did. All just ideas... But wouldnt it be cool. I completely agree with you that they will want to keep it as simple as possible. Simple is always best. I just think that the remote will be more similar to an iPod touch (although probably differently shaped) and have a touch screen which can change into a keyboard and be adaptable for other situations (i.e. change controls depending on what task the user is doing). And of course you will be able to control it with your iPhone or iPad. Believe or not, I do believe the TV will have a remote very similar to that, if not exactly that, the big deal about the iTV will be Siri, all you need to do is hold down the center ('home') bottom and talk to the TV. no need for anything else, only basic funtions as Pause/play, volume, Rwd/fwrd. I think the fact that you would have to hold down the button would defeat the purpose. Therein lies the problem. It needs to be waiting and listening at any moment, and yet not be able to be controlled by anyone in the room so that children don't continually mess with the channel while their parents are in the middle of watching something. Definitely will still work through iOS devices. The touch screen remote is a good idea especially for the key board and # pad, because I can see having to navigate one on the screen being a complaint. Was that much of a complaint from ATV2. I have one and use it often but I'm too lazy to complain about things like that.